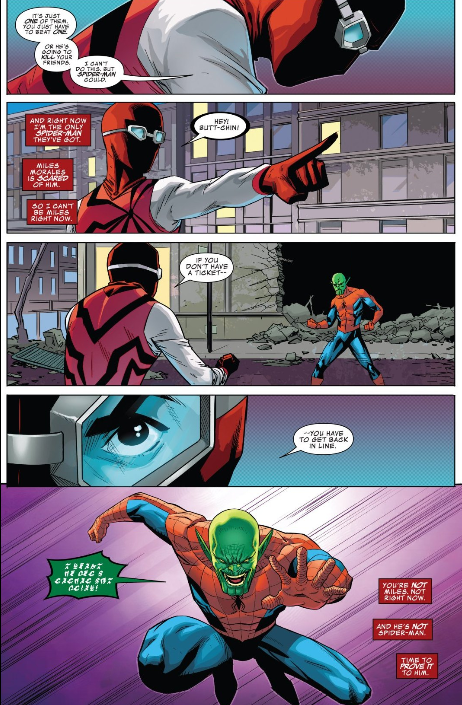 THE SCENE: In his early days as a hero, Miles Morales takes on a Skrull who is impersonating Spider-Man! 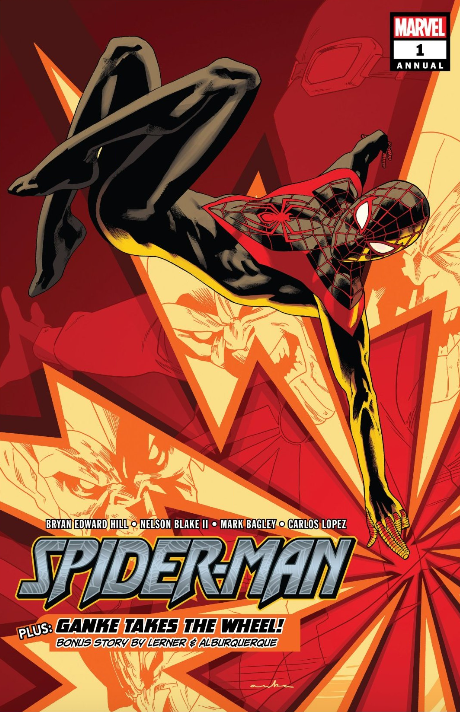 WHY IT’S AWESOME: Spider-Man Annual #1 was a welcome read this week, as last month Brian Michael Bendis officially put a bow on the ongoing adventures of Miles Morales. At least for now. My understanding is that a new series is in the works. You’d think there’d have to be, what with the Miles-centered Into the Spider-Verse hitting theaters in December. In the meantime, most of this annual takes place “years ago,” just as Miles is becoming a hero. The book does a little retcon work here, trying to figure out where our hero was in the main Marvel Universe (as opposed to the Ultimate one, where he debuted) around the time of Secret Invasion. When Miles, Ganke, and their friends are attacked by Skrulls at a party in Soho, Miles is forced to take action. As awful icing on the cake, one of them is impersonating Spider-Man! Then, to top it all off, he delivers a Spidey quip. Not a great one, mind you. But good, considering he’s a terrified teenager in a makeshift Spider-Man costume. That’s another item to note: Nelson Blake II designed Miles’ makeshift Spidey suit for this outing. I dig it. The shirt is a little on-the-nose for what’s supposed to be a spontaneous costume. But it’s still fun. The goggles even give it a little bit of a Spider-Man Noir vibe. This entry was posted in Comic Books/Graphic Novels, Panels of Awesomeness and tagged Alitha Martinez, Bryan Edward Hill, Carlos Lopez, comic book reviews, comic books, Cory Petit, Ganke (Marvel), Into the Spider-Verse (2018 Film), Marvel, Marvel Universe, Miles Morales, Nelson Blake II, Panels of Awesomeness, Rob Siebert, Secret Invasion (2008), single issue reviews, Skrull, Spider-Man, Spider-Man Annual #1 (2018), Spider-Man comics, Spider-Man costume, superhero comics on 08/10/2018 by primaryignition. If you’re only picking up one Marvel book these days, make it Champions. It’s fun, diverse without trying too hard to be, and particularly poignant these days. This issue’s subject matter might make some readers uncomfortable. But I suspect that’s the idea. It’s a book about young people coming together to take on problems that are at least partially based in reality. 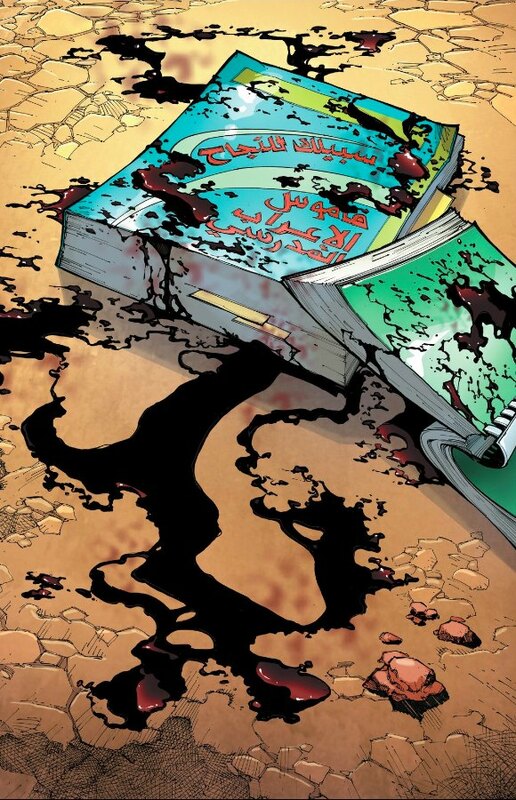 Champions #3 takes on Islamic fundamentalism. It brings our team to the middle east to face a militant group committing gender apartheid. In the issue’s own words: “They believe women are to be shamed. TO be hidden away, given no access to medical care or education. To be stripped of their human rights. … Young girls have been murdered in the streets for the ‘crime’ of carrying a schoolbook or being seen without a burqa.” Our heroes stand up for the defenseless, all the while trying to figure out who their team leader is. Some people don’t like this kind of thing in their superhero escapism. Case in point, Chelsea Cain getting harassed by Twitter trolls over her work on Mockingbird. But there’s also something to be said for what these characters stand for. Not just the Champions, but superheroes in general. Things like truth, justice, defending the defenseless, etc. So using superheroes to illuminate real world issues doesn’t usually bother me, so long as it’s done well. You can argue this issue lays it on thick at times (judge the how and where for yourself). But its heart is definitely in the right place. It gets you thinking. Ergo, it accomplishes its goal. There’s also a question of who the team leader is supposed to be. For my money, the obvious choice is Ms. Marvel. 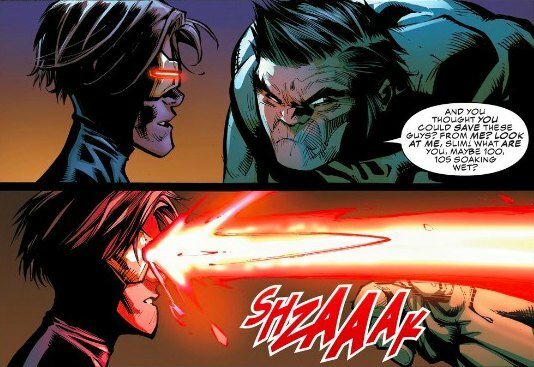 But the issue also floats Hulk and (perhaps in jest) Cyclops as candidates. I’m hoping the conclusion we come to here is that the Champions don’t need a leader. But you never know. Humberto Ramos continues to surprise with this series. His exaggerated, cartoony style doesn’t seem like a good fit for our super-serious main story. But in a way, he may be the key to why this issue works so well. Obviously, this is some heavy subject matter about things that happen to real people in the real world. But Ramos’ cartoony, exaggerated figures allow us to still see it through the lens of a superhero comic. This doesn’t feel like a contrived PSA comic, but rather something that actually occurs organically in the Marvel Universe we know. Perhaps more importantly, if you jump completely out of the fantasy realm with a story like this, you risk losing your audience by slapping them too hard with this brutal reality. Ramos’ art is a nice compromise. What’s more, Ramos hits the right notes to make us feel what the story needs us to feel. We’re frightened, sympathetic, and angry for these women who’ve been victimized for no good reason. The gravity of the situation is conveyed effectively, and we’re hopeful for them in the end. Of course, the superhero action stuff is done very well, and Ramos is always good at interactions between the teens. There are some awkward character placements and panel transitions early on during a scene on Hulk’s big stealthy jet thing. But that’s a con far outweighed by all the pros. 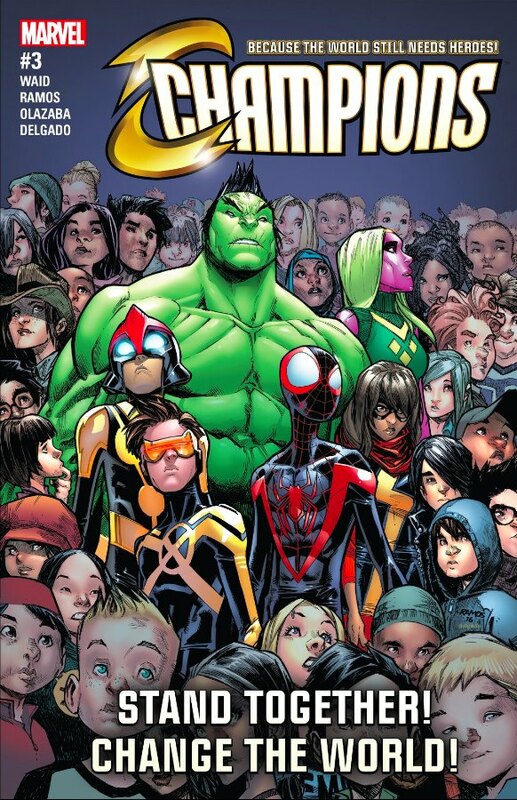 Champions feels like the comic we need right now, for a variety of reasons. Not the least of which is because these feel like the heroes we need right now. 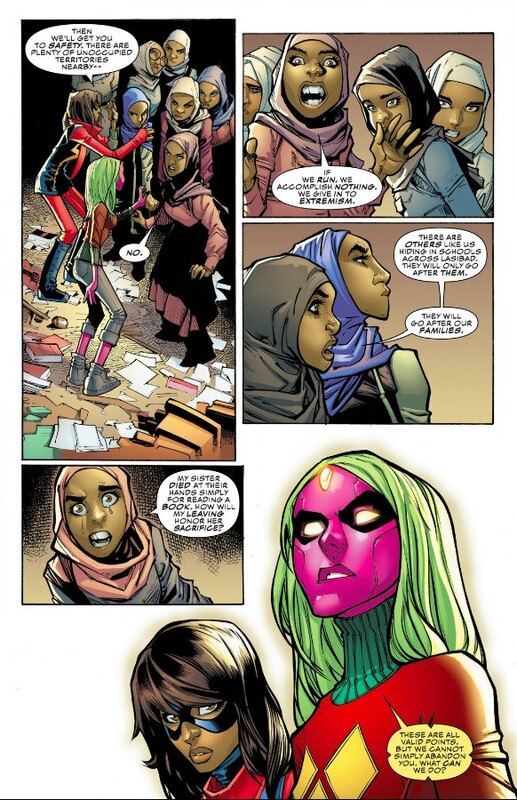 This entry was posted in Comic Books/Graphic Novels and tagged Amadeus Cho, Ask Me About My Feminist Agenda, Champions #3 (2016), Champions (Marvel), Chelsea Cain, comic book reviews, comic books, Cyclops, gender apartheid, Hulk, Humberto Ramos, Islamic Fundamentalism, Kamala Khan, Mark Waid, Marvel, Marvel Comics, Marvel Universe, Marvel's Champions, Miles Morales, Ms. Marvel, Nova, Rob Siebert, Sam Alexander, Scott Summers, single issue reviews, Spider-Man, Totally Awesome Hulk, Viv Vision on 12/12/2016 by primaryignition. 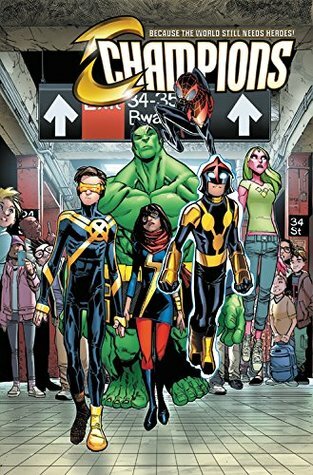 A Champions #2 Review – Superhero Camping Trip! A superhero camping trip. 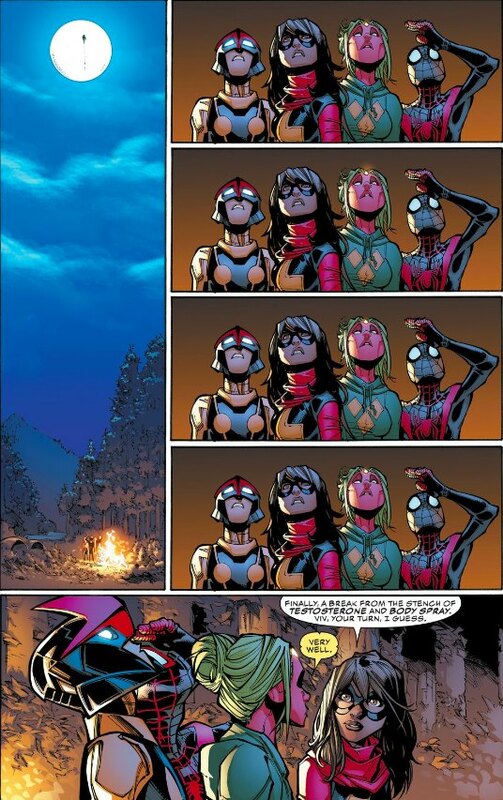 In Champions #2, Ms. Marvel gets the team together to bond with a superhero camping trip. Literally. With a campfire, weenie roast, and full costumes. It’s exactly the kind of gloriously hokey thing you’d expect a group of teenagers to do. It doesn’t make for an issue that’s big on thrills. But it’s a really internist way to play with the characters, and get basic information/exposition to the readers. It works! Hear that Benjamin Percy? Get the Teen Titans a tent and some damn sleeping bags! 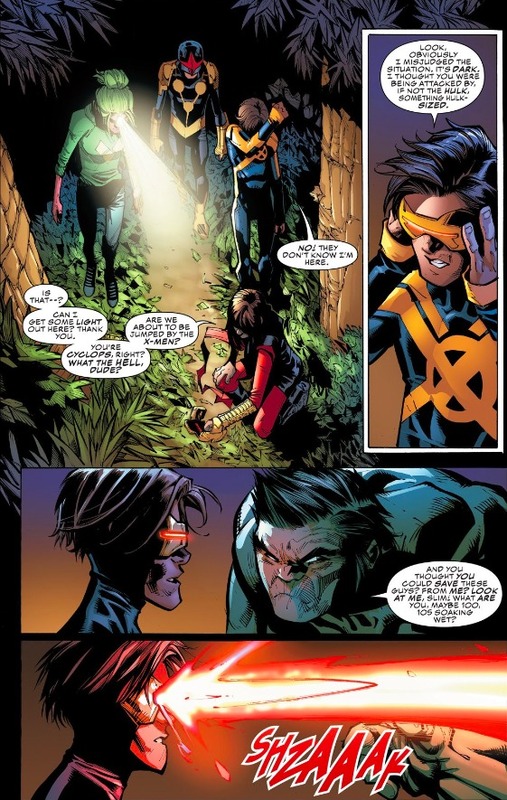 The most noteworthy aspect of this issue is the addition of young Cyclops of All New X-Men to the group. He crashes the trip, and we get some of the confrontational stuff you might expect when the younger version of a mutant controversy-magnet pops up at a gathering of hormonal teenage superheroes. Including a really funny moment with Hulk (shown below). Early in the issue, Ms. Marvel asks everyone to demonstrate their superpowers. This sequence fascinates me. It’s one of those things that’s so simple, you’d think every team book would have some version of it. Marvel and DC usually come into team books assuming readers know who everyone is. If that’s not the case, then the creative team opts to show us what everyone’s powers are, usually via a battle sequence. But Waid makes part of an issue out of it to lay everything out for new readers, and continue to develop the rapport between the characters. There’s a subtle brilliance to this for which I credit Waid immensely. I had no idea how much I missed this Waid/Ramos team working on a teenage superhero book. They did it 20 years ago with Impulse, and now they’re back and better than ever in Champions. Ramos has a style that’s very cartoony, but also very expressive and conducive to explosive action. The Hulk/Cyclops bit is a good example, as is the cover shot with the big punch from Nova. On the down side, panel duplication strikes again in this issue, as Ramos gives us the same image four times (shown below). I’m no artist, so perhaps I shouldn’t be the one to throw stones. But as a reader, this kind of thing always plucks me right out of the issue. Even a little change to one of the images would have helped, like lowering Spider-Man’s arm. It’s the only part of the issue I flat out dislike. it’s also interesting to me that Waid is writing both Champions and the not so all new or all different Avengers title. To an extant, he’s behind the Champions, and the establishment they’re broken away from. 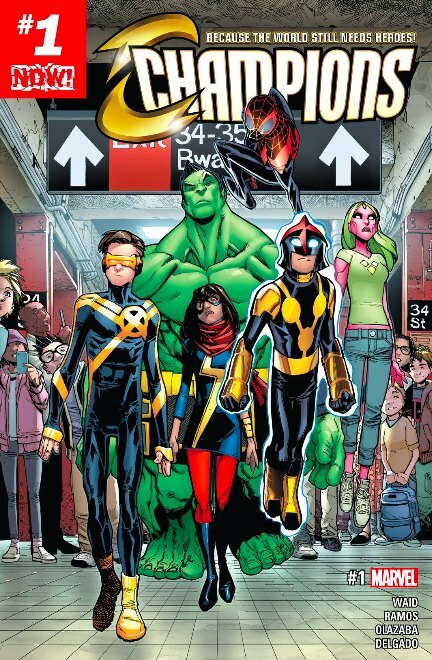 But considering that Spidey, Ms. Marvel, and Nova were a big part of what made All New, All Different Avengers so interesting, for my money Champions is now Marvel’s most compelling team book. At least for the time being. Not bad for only two issues. This entry was posted in Comic Books/Graphic Novels and tagged All-New X-Men, Amadeus Cho, Benjamin Percy, camping, Champions #2 (2016), comic book reviews, Cyclops, female superheroes, Hulk, Humberto Ramos, Impulse (DC Comics), Kamala Khan, Mark Waid, Marvel, Marvel Comics, Marvel's Champions, Miles Morales, Ms. Marvel, Nova, panel duplication, Rob Siebert, Sam Alexander, Scott Summers, single issue reviews, Spider-Man, superhero comics, superheroes, Teen Titans, Totally Awesome Hulk, Viv Vision on 11/07/2016 by primaryignition. PENCILLER: David Marquez. Cover by Marko Djurdjevic. An irony occurred to me after reading Civil War II #6. All this in-story drama and controversy among the superheroes is occurring because a teenager named Ulysses can supposedly see visions of the future. 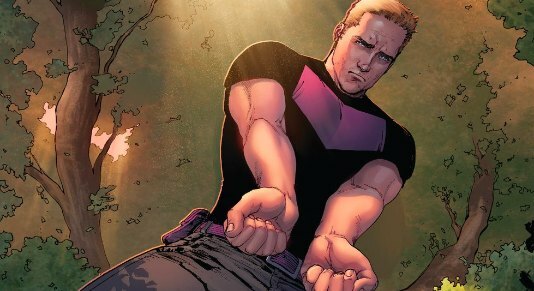 The actions taken by the heroes as a result of these visions have brought about the deaths of James Rhodes and Bruce Banner, the ruining of Clint Barton’s public life, and a lot of bad blood among our characters. 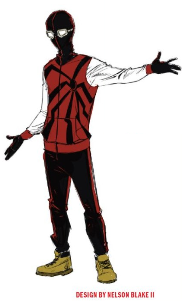 But now it’s all come to a head thanks to a vision of Miles Morales, Spider-Man, another teenager. As if we needed further confirmation that this story is really about the violence we see on the news every day, particularly involving young people. After last issue’s startling vision of Spider-Man moments after murdering Steve Rogers, the battle between the heroes has come to a stand still. Our characters reel from what they’ve just seen and ponder their next move. This issue brings us some of the best work David Marquez and have done together. Naturally, much of it involves Miles. 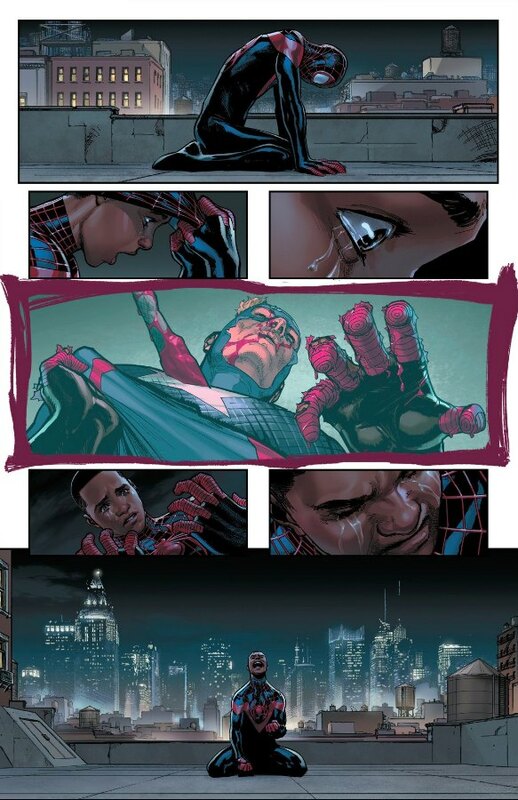 The genuinely unsettling two-page spread of Spidey and a dead Captain America is simply re-printed from last issue. I’d normally call that shamefully cheap. But it works to preserve the emotional intensity of the moment. 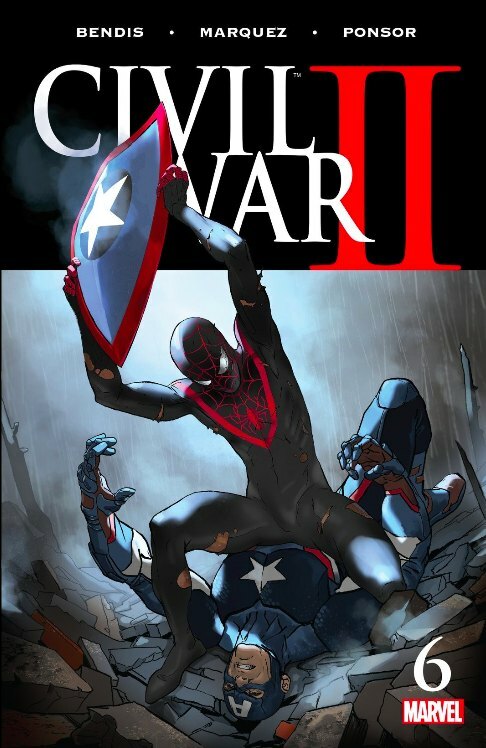 Marko Djurdjevic’s cover also adds a new dimension to the idea of Miles murdering Captain America. With his own shield? Really? C’mon man. This, of course, casts poor Carol Danvers as the bad guy. Her protege Ms. Marvel even stands against her in this issue (Though she’d already done that in the Ms. Marvel ongoing.). Carol has more or less been in the bad guy position the entire time, making her decisions based on events that could happen, rather than what has happened. Perhaps recognizing this, Bendis takes time in this issue to remind us she’s still trying to do the right thing, and doesn’t want to hurt Miles. 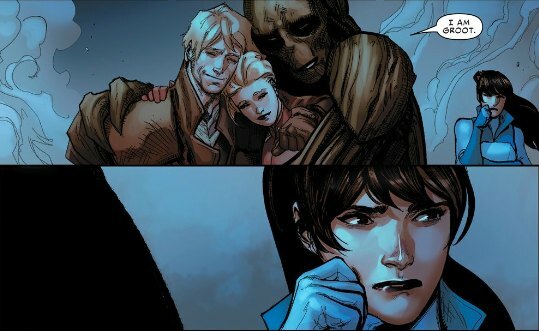 We see her guilt, and she gets a nice moment of reassurance from Peter Quill. But the violence that’s resulted from all of this is causing her case to fall apart. Kitty Pryde’s expression in the image below says it all. We get what I imagine was meant to be a bit of foreshadowing for Champions, as Ms. Marvel, Nova, and young Cyclops rally to protect Miles. The delays that have plagued Civil War II obviously tarnish that. But this scene was my first exposure to Riri Williams, who will be taking on the Iron Man role soon. I imagine that’s the case for quite a few readers. So perhaps the upside is worth it. 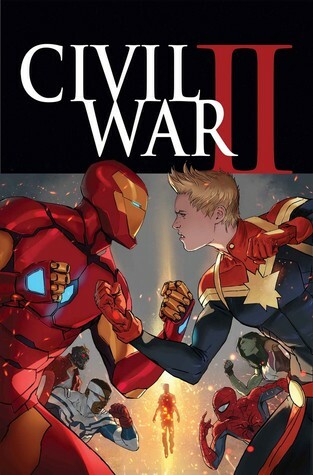 Civil War II showed up late, in more ways than one. This story just found its second gear last issue, and it finally feels it has the stakes an event comic should have. Hopefully those stakes continue to rise. Toward the end of the issue there’s a spooky page with Ulysses. A descent into evil may be forthcoming. The question is, does he drag Carol Danvers down with him? 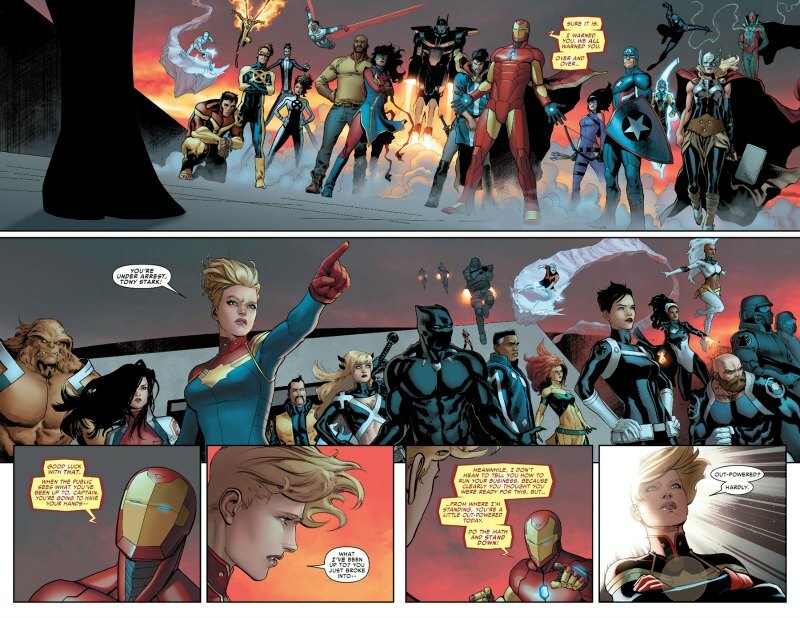 This entry was posted in Comic Books/Graphic Novels and tagged Black Panther, Captain America, Captain Marvel, Carol Danvers, Champions (Marvel), Civil War II, Civil War II #6 (2016), comic book reviews, comic books, David Marquez, event comics, female superheroes, Groot, I Am Groot, Iron Man, Ironheart, Justin Ponsor, Kitty Pryde, Marko Djurdjevic, Marvel, Miles Morales, Ms. Marvel, Peter Quill, Riri Williams, single issue reviews, Spider-Man, Star-Lord, Steve Rogers, superhero comics, superheroes, Ulysses (Inhumans) on 10/28/2016 by primaryignition. Miles Morales, Kamala Khan, and Sam Alexander all made their debuts in different books by different creators. But when they’re put together, they somehow become one of the most compelling teams in modern superhero comics. They see the Marvel Universe through younger eyes, and creators have mined a lot of fun and intrigue from that. Their ethnic diversity doesn’t hurt either. 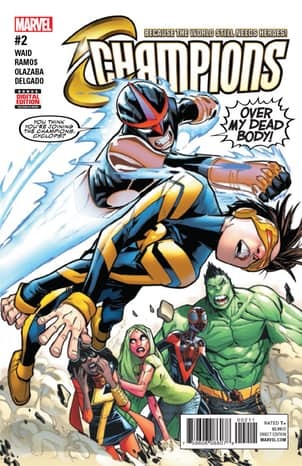 The next logical step for this trio occurs in Champions #1, as Mark Waid gives them their own team, fueled by much of the same youthful idealism and teen angst that made them such a breath of fresh air to begin with. In the wake of Civil War II, Miles, Kamala, and Sam have broken away from the Avengers. In short order, they opt to form their own team, with the addition of Hulk (Amadeus Cho), and Viv Vision. Young Cyclops of All New X-Men, who we see on the cover, presumably joins the team next issue. 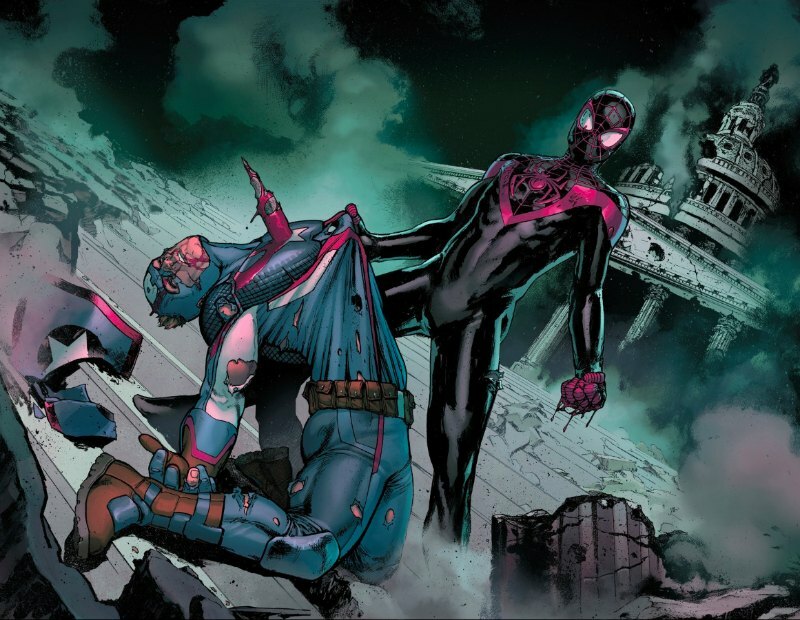 Two weeks ago I referred to the image of Miles Morales clutching Captain America’s dead body in Civil War II #5 as a “black lives matter” moment. In essence, it’s Marvel looking at real events through its own flamboyant and colorful lens. We get a bit of that here, though it’s less poignant, and more direct. Obviously, this is a thinly veiled speech about modern police affairs. But one can potentially read some other things in there, i.e. politics, the American wealth gap, etc. It all depends on your perspective. Either way, that thread of reality makes it that much easier to connect with Champions. Impossible as it seems, this is the first collaboration between Mark Waid and Humberto Ramos since Impulse in 1995. Ramos has always been an interesting study. His style is incredibly exaggerated and cartoony, with an energy to match. But when its time for him to get serious, he’s more than up to snuff. Case in point, things get more than a little grim when our heroes find a human trafficker. One that’s dressed like a clown, no less. The scene that follows has all the appropriate wait, and transitions perfectly into Kamala’s big moment. I wouldn’t put Ramos on a Punisher book. But his versatility is delightful. Champions has piqued my interest with a tremendous set-up, likable young characters, and a creative team that’s more than capable. Obviously we’re only one issue in. But the smart bet is this will be a quality book for the foreseeable future. This entry was posted in Comic Books/Graphic Novels and tagged Black Lives Matter, Champions #1 (2016), Champions (Marvel), Civil War II, Civil War II #5 (2016), comic book reviews, comic books, Cyclops, Hulk, Humberto Ramos, Kamala Khan, Mark Waid, Marvel, Miles Morales, Ms. Marvel, Nova, Rob Siebert, Sam Alexander, single issue reviews, Spider-Man, Totally Awesome Hulk, Viv Vision on 10/07/2016 by primaryignition.